What is the Cheapest Way to Ship a Package? Finding the lowest cost service to ship a package to a domestic address is not always easy. Private carriers such as UPS and FedEx include many different additional costs such as fuel surcharges and rural area delivery fees in addition to the core delivery cost. The USPS provides a lot of great options for residential delivery, but what about delivery to a business? Size: What are the dimensions of your package? The size of your package is a big indicator of your cost. Shipping carriers have limited space in their delivery trucks, and the more space your package takes up in the truck, the more you will have to pay. The first step in determining the price of your package is to know the actual measurements of the box you’re using (such as 12″ length × 10″ width × 8″ height). Once you have this information, input the dimensions into your shipping software or the shipping carrier’s website. The dimensions will help determine the price. Weight: How heavy is your package? The second variable that determines the shipping rate is the weight of the package. The weight should include the product you are shipping, the packing material (bubble wrap and tape) and the box used for shipping. All national carriers round up to the next whole pound for the shipping cost. So if your package weighs 2 pounds, 4 ounces, you will be billed at the 3 pound rate. The one exception to this rule is First Class Package Service from the USPS. This service determines price based on ounces rather than pounds. But the maximum weight is 15.99 ounces (just under 1 lb.). 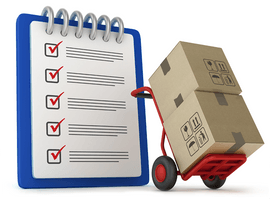 After your package is prepared for shipment, including all filler/tape, place your package on a scale to determine the weight and input that weight into your shipping software or carrier’s website. Since shipping carriers need to load their trucks to fit in as many packages as possible, the carriers charge more for a larger box that takes up more space on the delivery truck compared to a smaller box. This pricing program is known as Dimensional (DIM) Weight. As an example, a one pound package that contains a pillow that is placed in a 28″ length × 20″ width × 6″ height box takes up significantly more real estate in the delivery truck compared to a one pound package that contains shoes that is placed in a 14″ length × 8″ width x 6″ height box. So the national carriers will charge a DIM Weight fee to compensate for the real estate the package containing the pillow is taking up on the delivery truck. That 1 lb. package with the pillow will be billed at the 20 lbs. rate due to DIM Weight. Get more info on Dimensional Weight. UPS and FedEx use DIM Weight for all package sizes. 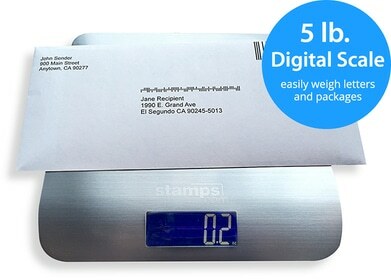 The USPS uses DIM Weight only for packages that are larger than 1728 cubic inches (larger than 12″ length × 12″ width × 12″ height). Distance: Where is your package traveling to? Another variable that impacts shipping rates is the amount of distance a package is traveling. Shipping carriers have split the U.S. into 8 shipping zones based on the distances from the mailed from zip code. The farther the shipping zone your package is traveling from its destination, the higher the cost. If you are using shipping software such as Stamps.com, the software will automatically determine the shipping zone for you. Likewise, if you purchase postage at the Post Office, the USPS computer system will determine the appropriate shipping zone. Speed: How quickly does your package need to reach its destination? The final variable that determines shipping rates is speed of delivery. Some people need their packages to be delivered overnight. Others need their packages delivered within 3 days and still others can wait up to 7 days. The speed of package delivery plays a big impact in the cost of shipping with overnight delivery costing up to five times the amount of Ground delivery. Stamps.com makes determining the shipping cost of a package very simple. Once you input the delivery address, box dimensions and weight, Stamps.com’s shipping calculator will automatically determine the correct shipping zone and provide multiple shipping options based on cost and delivery speed for all USPS mail classes. Plus, you’ll get discounts up to 40% off Post Office rates.